Besides Earth, there are seven planets in our solar system (poor Pluto). If you were to line them up end to end, could they fit between the Earth and the Moon? Basically yes. The image here gives the Earth-Moon distance using the center-to-center measure. Using that value they definitely fit. If you take their radii into account, then the seven planets are just slightly over. It also doesn’t take into account the fact that the Earth and Moon are not always the same distance apart, because the Moon’s orbit isn’t quite circular. 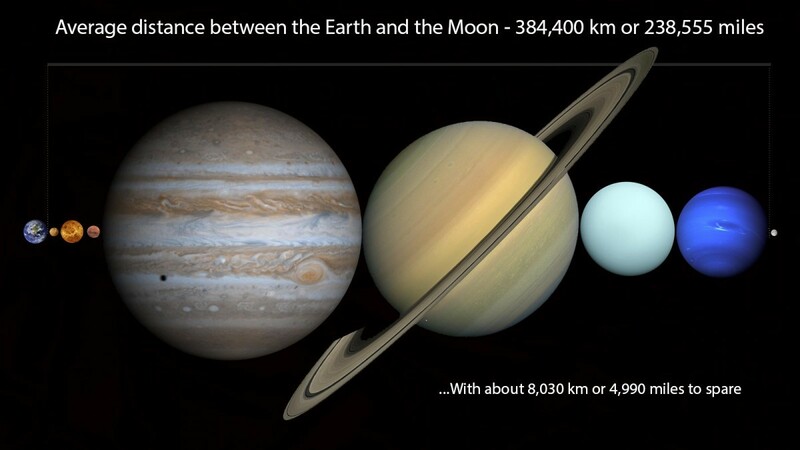 But basically, the solar system fits within the space separating Earth and Moon. Besides being a really cool fact, it emphasizes that the solar system is mostly empty space. We visualize the solar system as being filled with planets, asteroids and comets but basically there is the Sun and clumps of dust. The Sun makes up 99.8% of the mass of the solar system. I’m calling shenanigans. No fudging the question to get the answer you want, by saying center to center. That said, I really enjoy your writing. Thanks for sharing your knowledge!